Proudly display up to 12 of your most cherished AA recovery chips! Each of these beautiful chip holder/display plaques features 12 spaces for mounting special Alcoholics Anonymous medallions. 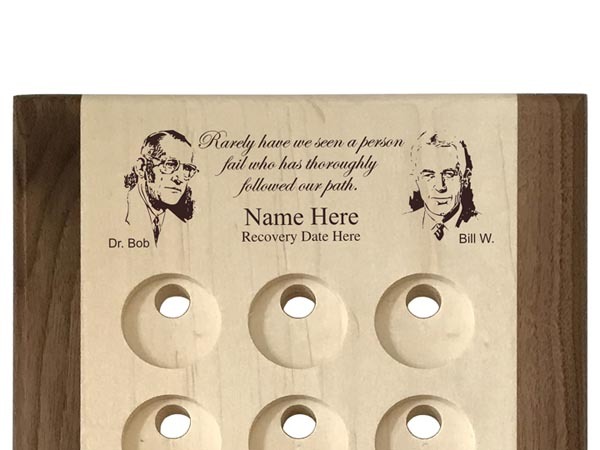 Your name and sobriety date are expertly laser engraved at the top of the plaque along with images of the AA program founders; Bill Wilson and Dr. Bob Smith. ...a WoodenUrecover exclusive! What a wonderful way to display your recovery tokens! The backside of each medallion holder display plaque is "key holed" making it simple to mount flush to any wall, door, or flat surface. Your tokens are held securely in place with the provided mounting tabs. 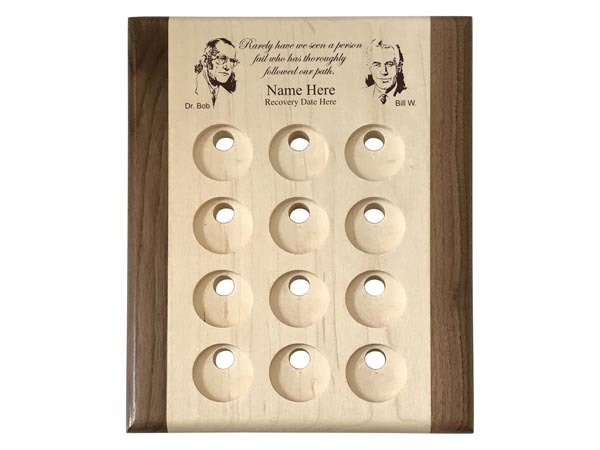 In addition, each medallion pocket has an access hole drilled all the way through the plaque - making it much easier to remove tokens when/if necessary. 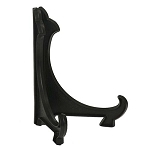 Use one of our Display Easels if you prefer to display your medallion holder on a shelf, table, or desk.